The effects of fertilization and residue retention practices on enhancing crop yield and soil productivity, have been extensively investigated in various cropping system studies. However, various potential interactions exist among system components (soil, plant, microbial). The multitude and complexity of these interactions results in variability in agroecological responses, such as the soil extracellular enzyme activities (EEAs). 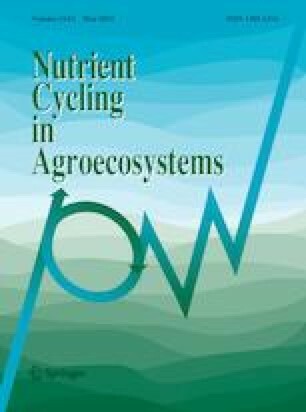 Using a meta-analysis of 85 peer-reviewed articles published in the past three decades, we synthesized the EEAs of four major soil enzymes (urease, phosphatase, invertase, and peroxidase), which are affected by various fertilization and residue management practices used in cropping systems of China. The combined application of straw residues and chemical fertilizers, and straw residues only significantly increased soil organic carbon (by 38 and 47%, respectively) and total nitrogen (by 26 and 57%, respectively) as compared to the non-fertilized control. Manure plus chemical fertilizer treatments showed a consistent increase in urease, phosphatase and invertase activity by 86, 34 and 37%, respectively, as compared to the non-fertilized control. The use of inorganic fertilizers increased the activity of soil EEAs involved in carbon- and phosphorus-cycling, but did not decrease EEAs involved in nitrogen-cycling as expected. The experimental duration had a significant impact on urease activity, particularly with unbalanced application of chemical fertilizers. Therefore, along with managing fertilizer type, considerable attention should be given to adopting alternative production systems and increasing cropping intensity (preferably double cropping), to enhance soil EEAs. Fuhong Miao and Yuan Li have contributed equally to this work. The online version of this article ( https://doi.org/10.1007/s10705-019-09991-2) contains supplementary material, which is available to authorized users. We highly appreciate two anonymous reviewers and the editor for their very insightful and constructive comments. This research was supported by grants from the Forage Industrial Innovation Team, Shandong Modern Agricultural Industrial and Technical System (SDAIT-23), Doctoral Scientific Research Startup of Qingdao Agricultural University (6631116024), and the China Scholarship Council (File no. 201,606,180,104). The authors are very grateful for revisions to the manuscript by Kathleen K. Treseder (University of California, Irvine), and for plotting the maps by Qisheng Feng (Lanzhou University).